We loved all aspects of the preparation stage (including making lots of wonderful bespoke items) so much so, that afterwards, as inspired newlyweds, we were so enamoured by the whole wedding industry we decided to launch Lo & Behold and continue the journey... We haven’t looked back since and you could say we hit the ground running! We live in Southsea, a quirky seaside town in Hampshire that’s full of creative people and independent businesses, and we’ve just bought our first home together. In-between doing up the new house and running our own creative businesses we have managed to find the time and dedicate every spare minute to making Lo & Behold a success. 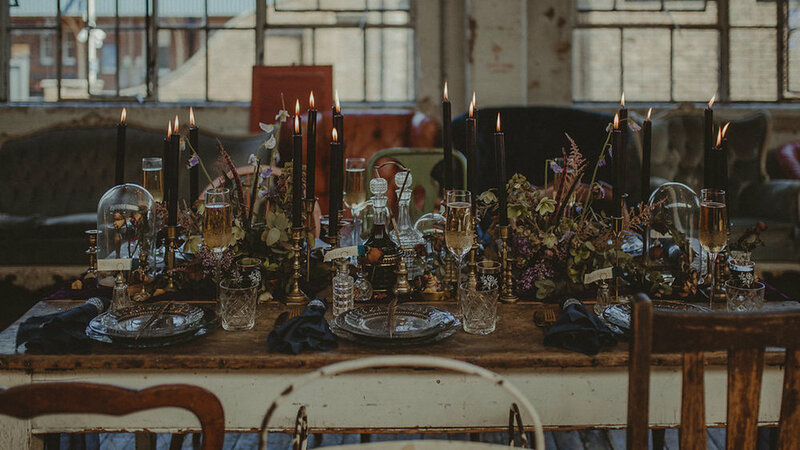 We specialise in event planning, styling & bespoke design for the bohemian, wild at heart and free spirited. We returned to a local wedding fair one year on and found ourselves to be among the established traders. To be ‘known of’ and respected amongst our industry friends is an incredible feeling. There was this one lovely lady who had recently launched who came up to me and say “Oh-My-Gosh, I follow you online and love everything you do” … I mean wow… that was just like gold dust, such an incredible feeling and a happy moment! I also had a lovely email the other day from a bride-to-be who is getting married at one of our wedding day venues, on our 2-year anniversary and wants to hire our naked tipi to get married under…it really feels like we’ve come full circle and I’m just so excited about what lays ahead. Since launching we have been overwhelmed by the supportive, kind and welcoming industry we have found ourselves in and when we meet our customers and they in turn entrust us to help realise their wedding day, which is a true representation of their love… that’s a pretty big inspiration right there! The creativity and variety. We love that the job changes day to day - we could be designing stationery on Monday, having client meetings and getting excited with brides-to-be on Wednesday and getting up at dawn on Saturday to head to an old barn ready to transform it for a beautiful wedding. This keeps us engaged and excited and we feel very lucky to find ourselves in this situation! Personally, getting to explore my creativity and collaborate on styled shoots, creating beautiful things and being able to help ensure someone’s wedding day is everything they hoped it would be is just the best thing. On a recent job I was told by an incredibly stylish bride that she was overwhelmed by the finished result, it was better than she could have imagined. After months, even years, of planning, to be able to help make that vision a beautiful reality is a true honour! Probably our collection of items we have to hire out. We specialise in handpicked eclectic items that we adore or making beautiful things ourselves, and refuse to have anything in our collection just because it’s on-trend or fashionable - we have to love it to hire it out. Whilst that may mean that we miss out on some business, we prefer to remain true to what we love and what our style is! Stay true to who you are and what you want!